The children’s charity has said it was still coping with gaps in state in funding first introduced a decade ago. CHILDREN’S CHARITY BARNARDOS has said it will take a “shift in strategic direction” and, due to financial concerns, has made a “small number” of employees redundant. A circular sent to the charity’s 300 workers last month said that Barnardos would no longer take an “all-children focused political mobilisation approach” in its advocacy work, the Irish Times reported today. In a statement to TheJournal.ie, Barnardos CEO Suzanne Connolly said the redundancies would be coming in its advocacy and learning and development functions “because of gaps in state funding following cuts instigated in 2009″. “We have prioritised continuation of services to children and families using our voluntary funds to make up gaps in state funding and we have made no direct cuts in this area,” Connolly said. She said that if Barnardos wasn’t faced with these financial challenges, then no positions would be made redundant. The charity has been operating in Ireland since the 1960s, and offers early years and family support services to more than 15,300 children and families a year, it says. Going forward, Connolly said the charity would continue to lobby to ensure vulnerable children are given the supports they need. “In particular we will be advocating strongly for the investment in our intensive family support services for vulnerable children and families living with addiction, domestic abuse, parental mental health issues, separation and bereavement, and in the area of child protection,” she said. 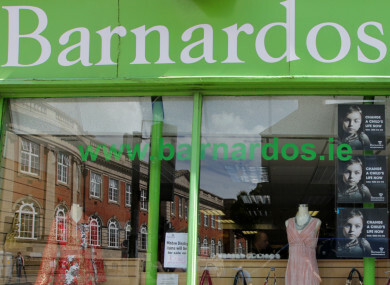 Email “Barnardos confirms redundancies amid financial concerns as it makes 'shift in strategic direction'”. Feedback on “Barnardos confirms redundancies amid financial concerns as it makes 'shift in strategic direction'”.